Wheat is now grown on each continent, and, in terms of its total production is one of the world's two most important cereal crops. Only rice rivals it, and maize, barley, sorghum, millets, rye, and oats come behind (Table 2.1). Unraveling the origins of wheat as a global crop involves two sorts of questions. 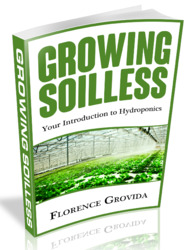 First, what are the botanical origins of the different types of wheat? Second, what role did the evolving wheats play in the origins of agriculture as a mode of human life? Studies in archaeology, paleoethnobotany, cytogenetics, and plant biochemistry in the past forty years have been combined to suggest that the answers to these two questions are completely and inseparably intertwined. Source: Food and Agriculture Organization, Food Outlook, no. 5-6, May-June 1995, p. 2. Chinese, the existence of wheat was connected to divinity. The Greeks, for example, considered wheat the gift of Demeter, goddess of the fruitful soil. Ceres was the counterpart of Demeter in Roman mythology,15 and our English word "cereal" is derived from this ancient deity. Science has preferred natural rather than supernatural stories for the origin of wheat. A series of studies in the twentieth century have indicated that wheat in its many varieties was the product of a complex series of hybridizations among what originally were wild grasses of southwestern Asia (Figure 2.3). Some of these hybridizations occurred most probably under conditions of cultivation, that is, after wheat had been domesticated for agriculture. Figure 2.3 Origins of cultivated wheats from wild grasses. Numbers in parentheses refer to number of chromosomes. Line drawing by Tim F. Knight. 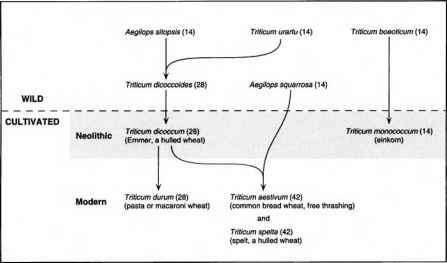 Adapted from T. E. Miller, Systematics and Evolution, in Wheat Breeding: Its Scientific Basis, ed. F. G. H. Lupton (London: Chapman and Hall, 1987), p. 22. We are particularly interested in the spread of wheat to the four countries critical to the development of high-yielding varieties in the years after 1940: England, Mexico, the United States, and India. In England (Figure 2.4) and India (Figure 2.5), wheat came several thousands of years ago and has been cultivated every year since then. In many respects both England and India are "wheat civilizations" in the sense that this cereal was a prime component of their existence as settled societies. Wheat came later to the United States and Mexico because it was an Old World crop that did not reach the New World until Columbus's voyage of 1493. 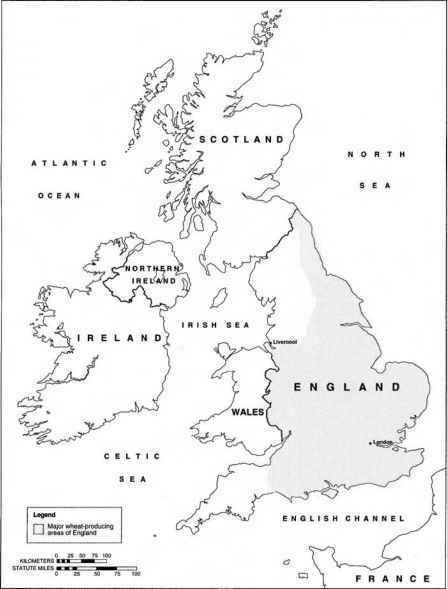 Figure 2.4 Major wheat-producing areas of England. Line drawing by Tim F. Knight. Outline of map adapted from National Geographic Society, British Isles (1:1,687,000) (Washington, D.C.: National Geographic Society, 1979), 1 p. Wheat-growing areas adapted from U.S. Department of Agriculture, Major World Crop Areas and Climatic Profiles (Washington, D.C.: U.S. Department of Agriculture, 1987), Agriculture Handbook no. 664. 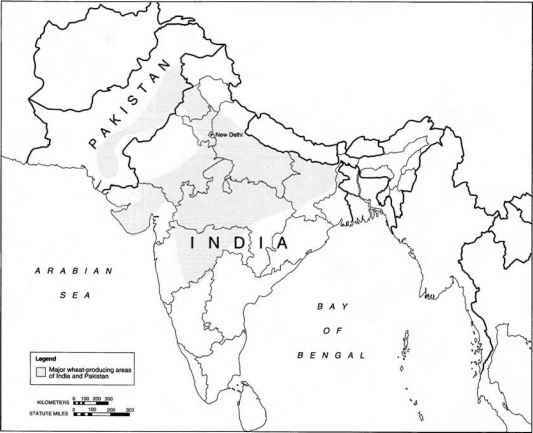 Figure 2.5 Major wheat-producing areas of India and Pakistan. Line drawing by Tim F. Knight. Outline of map adapted from National Geographic Society, South Asia with Afghanistan and Burma (1:6,522,000) (Washington, D.C.: National Geographic Society, 1984), 1 p. Wheat-growing areas adapted from U.S. Department of Agriculture, Major World Crop Areas and Climatic Profiles (Washington, D.C.: U.S. Department of Agriculture, 1987), Agriculture Handbook no. 664. Regardless of why it may have taken a long time for the cultivation of wheat and barley to intrude into South Asia, one of the world's first complex and monumental societies eventually emerged along the course of the Indus River in what is now modern Pakistan. Harrapan culture, named after the major ancient city at Harrapa, thrived from about 2500 to 1600 B.C. At its peak the Indus civilization stretched into what are now the Indian states of Rajasthan and Gujarat. Wheat was its most important crop, but these people were also the first to begin using cotton for cloth, and they also relied on rice, peas, dates, mustard seeds, and sesamum. They also had domesticated many animals, including dogs, cats, camels, sheep, pigs, goats, water buffalos, zebus, elephants, and chickens.27 To this day, wheat remains a foundation stone of the modern Indian civilization. Wheat came to the Americas with European invaders. Columbus recorded bringing wheat, beans, and chickpeas on his second voyage in 1493. The Spanish conquest of Mexico led to wheat and barley being grown around Mexico City by 1535 and exported to the West Indies. As the Spanish invasion spread northward to what is now Texas and New Mexico, wheat went along. French exploration and conquest of Louisiana also brought wheat into Texas in the eighteenth century.30 Similarly, the invading English brought wheat with them to North America, planting wheat at Jamestown in 1607, and subsequent waves of settlers brought wheat to other European outposts.31 Wheat now ranks as one of the foundations of New World agriculture. Only maize rivals it in terms of total production. When did wheat arrive in north america? How is cut the british isles? What is the origin of the English word cereal? How many Production of wheat after green revolution in world ?